Another wonderful film by Makoto Shinkai and this time it is about a fantasy adventure into an unknown world. How it puts the story together in 2 hours is simply engaging and enjoyable to watch. There have been plenty of anime about a fantasy adventure into an unknown world and most of them are pretty similar in plot style. 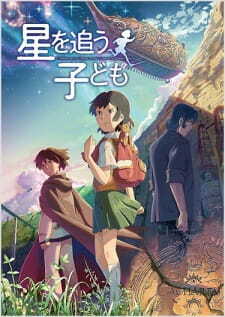 However, Hoshi wo Ou Kodomo takes a different direction and incorporates mystery and unexplainable phenomenon into the mix which results in quite a good story to watch. I felt the anime felt really similar to those Disney "Lost Worlds" films such as Atlantis. There is plenty of "magic" and mystery and if you are quite acquainted with Disney films, you will instantly love this anime. The story of course, is pretty much all mysterious and there really is no point in asking "why" to this and that throughout the film. It starts off with an old crystal radio owned by a girl named Asuna Watase. A mysterious melody is heard and she wonders where it came from. The next day she meets a boy named Shun and she discovers that he is from the underworld, Agartha. She then follows him down below and discovers a mysterious place that is full of monsters and mystery. What she discovers down there is a secret that may hold the key to life itself. Already hooked into the plot? Yes, it is quite engaging and for those for have vivid imagination and just love a quick fantasy story, Hoshi wo Ou Kodomo is perfect for you. 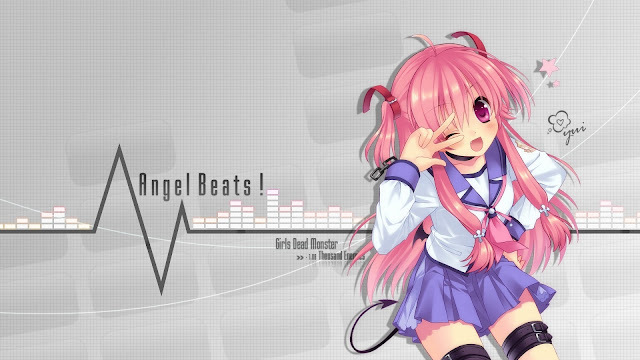 Today's featured wallpaper is Yui from Angel Beats!. Yui is a big fan of Girls Dead Monster (the name of the band in the anime), also acting as an assistant for publicity and other matters. She became the lead vocalist after Iwasawa(one of the lead singers in the band) disappeared. She had sung "Thousand Enemies" as a lead vocalist while the other song, "Shine Days", was not fully sung in the series, but only its chorus. She is considered lively and always happy.